Bitcoin Wednesday’s special workshop on Governance and The Blockchain at Pakhuis de Zwijger on 2 December, 2016 brought out a diverse crowd and many different perspectives. Here are some random thoughts and observations related to this event. An open blockchain may prove to be one of the most exciting and disruptive technologies in the field of governance. It’s still very early, but don’t be surprised to see another revolution on its way. For example, during his Streaming Money keynote for Bitcoin Wednesday, Andreas Antonopoulos explained how the blockchain consensus mechanism allows its participants to commit value to choices. From this observation you might conclude that blockchains with relatively high levels of support can be considered prediction markets for new kinds of democracies. If so, then the Bitcoin blockchain, despite its flaws, appears to be one of the best solutions we have. The second chart shows the Bitcoin price over time based on historical data from the Bitcoin Average website. 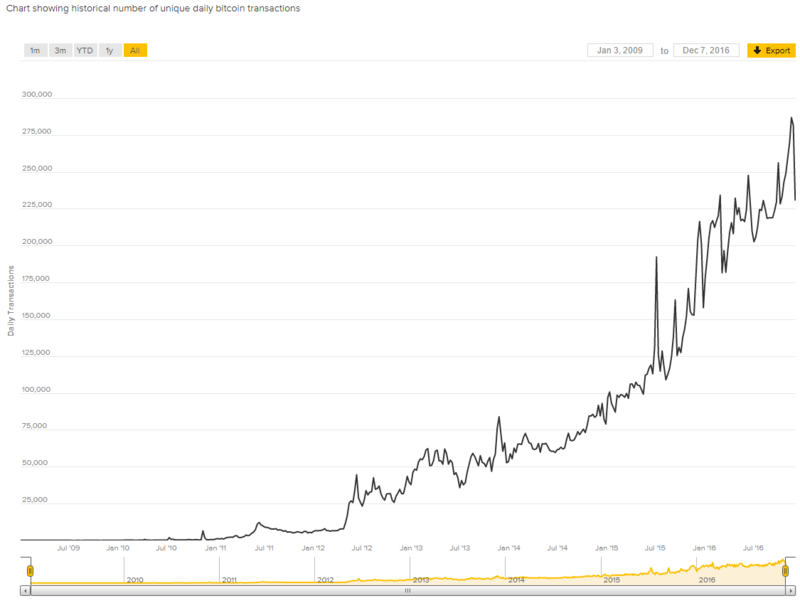 Since the end of 2015, the price of a Bitcoin has increased about 300%. The two graphs together suggest that the market is relatively satisfied with the network’s progress despite these serious performance issues. You can contrast these results with the situation for the second largest digital currency, Ethereum Modern, which has recently lost market cap while conducting a series of hard forks. Mr. Antonopoulos considers hard forks to be part of Ethereum’s governance model due to its “larger attack surface”. What this statement means is that Ethereum, which was designed to allow Turing-complete decentralized applications, also known as self-executing scripts or smart contracts, seems to require forks to protect it against hacks. The DAO hack in June 2016 and the fork that resulted from it is one famous example. The point to be made here is that Bitcoin is relatively stable in comparison. It is the most proven blockchain, and at the end of 2016 is performing much better in the market than Ethereum. (c) Keep their holdings in both Ethereum Modern and Ethereum Classic and just wait it out. In theory they could — still can — do any combination of the above at any time. You might consider the fork a great success: there are now two Ethereum coins in the top ten in terms of their global market cap, so in a sense both sides got what they wanted. Comparing this situation to the problems in real-world economies and governments is illuminating. For example, the battle for control between American Democrats and Republicans in almost every election cycle comes down to a conflict between the majority of voters in densely populated cities, the areas which generate most of the country’s wealth, and the poor rural areas which have less money and much fewer people. The map below from the New York Times shows the current vote count in which the Democrats received 2.6 million votes more than the Republicans but still, due to flaws in the American voting system, lost the election. In a blockchain governance experiment — as this technology is still very new — a hypothetical Red, White and Blue Coin could split into two separate ones, a Red and a Blue. There has been an ugly online war about how to approach the Bitcoin network’s perfomance issues. No, you don’t have to take sides in this conflict. There are good and smart people on both sides of the debate. Impressive innovation (and much less inspiring arguing) is coming out of it, which can only be good for the whole industry. Under ideal circumstances I wouldn’t be asked to navigate this political minefield. However, I’ve had people on both sides try to tell me that being neutral means I somehow support the other side. That’s simply untrue. There’s a carnival atmosphere around the block size debate, which from my point of view looks like another attack on Bitcoin. A spokesman from an alternative system would say, “How can you trust anything they do?” The alternative communities are not just singing Kumbaya around the campfire. Every blockchain eventually has serious technical problems to solve. Those problems are part of what makes the industry so unique. We see something similar in U.S. politics: The Republicans, aided by Russian hackers, successfully waged an effective misinformation campaign. 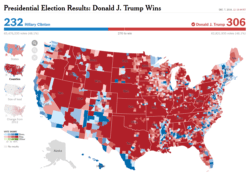 The Democrats forgot to tell the people what they stood for, and it cost them the election — although not the popular vote. There should always be — in my opinion will always be — room for smart ideas on all sides of the debate. To those taking extreme positions on either side, the main question should be, are you so sure that your solution is the best one that in the case of a fork you’d be willing to sell of your tokens in the one chain and invest them all immediately in the other one? If you are holding significant amounts and your answer is ambiguously yes, I would be impressed. As we see with Ethereum, making changes to a successful blockchain is a tricky business, not unlike changing the jet engine of an airplane while it’s in the air. Sooner or later every decentralized network will have to deal with the same challenges.